In 1686 Petronella Oortman, a widow and wealthy in her own right, married the silk merchant Johannes Brandt (1654-1731). The couple lived on Warmoesstraat in Amsterdam. That same year, Petronella Oortman began her magnificent doll's house. 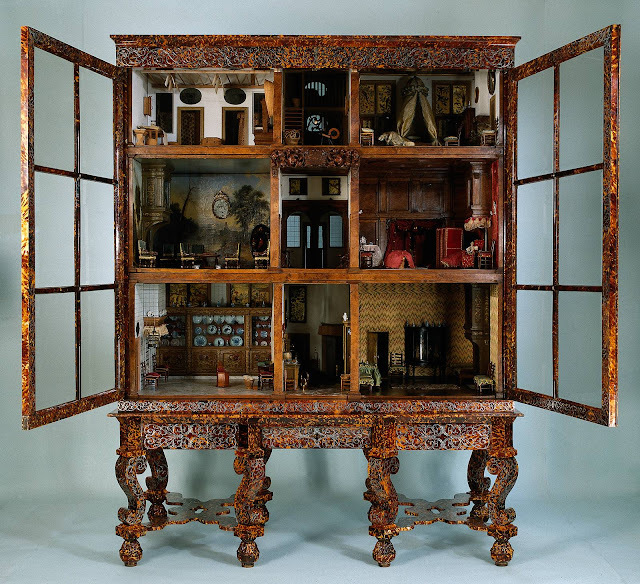 She spent the following four years collecting miniature objects and furniture for the house, spending an estimated 20,000 to 30,000 guilders, the price of a real house along one of Amsterdam’s canals at that time. Seventeenth-century doll's houses were not children's toys, they were a hobby* for ladies, comparable to the cabinets in which gentlemen kept their collections. This is one of three seventeenth-century doll's houses that have survived intact. It was commissioned by Petronella Oortman, a wealthy Amsterdam lady. The house is remarkable in that all of the components are made exactly to scale. Petronella ordered miniature porcelain objects from China and commissioned furniture makers and artists to decorate the interior. It was extremely costly to create a model house like this. Petronella probably spent between twenty and thirty thousand guilders on her doll's house. In the seventeenth century she would have been able to buy a real house along one of the canals for that price.